Welcome to the SureRecruitment.in jobs portal here you can get all the latest information on jobs, career development & advice on career management, latest jobs, high paying jobs, govt jobs. Search for best suitable jobs news, updates & notifications. Find and apply to your dream jobs. Graduation in any subject or any equivalent qualification recognized by the Central Government from a recognized university. Selection will be based on the initial online exam, main online exam, descriptive examination and interview. For GN and OBC, pay Rs. 750 / - for SC / ST / PWD / 120 / - examination fee through debit card / credit card / internet banking. 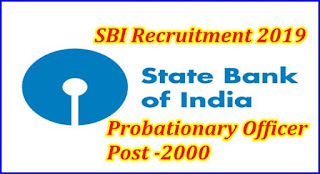 Interested candidates can apply online through SBI Recruitment 2019 (State Bank of India Recruitment 2019) website https://www.sbi.co.in. Before you apply for SBI recruitment, read the full notification / advertisement. We are not recruiters but we find latest job, latest recruitment, daily recruitment, high paying jobs, recruitment online, weird jobs and recruitment trends for you.